ISLAMABAD: Police on Monday booked the motorcyclist, who was hit by a vehicle driven by an American diplomat on Sunday night, for negligent driving. The federal capital’s police stated that the motorcyclist did not stop and give way to the vehicle coming from his right side, hence, he is at fault. Police also reportedly booked the chief security officer of the embassy, Taimoor Pirzada, for confronting law enforcers after the incident. The FIR [First Information Report] was lodged in the Secretariat police station with Assistant Sub-Inspector Mohammad Yousuf as the complainant. According to the report, the accident, which occurred on Sunday night, was a result of the victim Nazakat Islam’s “negligence and recklessness”. Nazakat and his companion Mohammad Waseem suffered minor injuries. Nazakat has been charged with Section 279 (rash driving or riding on a public way) of the Pakistan Penal Code. Pirzada has been charged under Sections 353 (assault or criminal force to deter public servant from discharge of his duty) and 186 (obstructing public servant in discharge of public functions) of the PPC. The diplomat was handed over to Foreign Office (FO) officials Sunday night after recording his statement at the police station. Police said Nazakat Aslam Awan and Mohammad Waseem were riding a motorcycle when they were hit by a vehicle on Constitution Avenue near the Pak Secretariat complex at around 9:40pm. 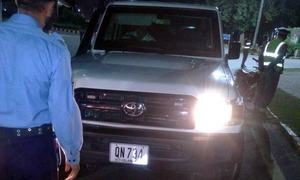 The car was being driven by US Embassy Second Secretary Chad Rex Ausburn. Police, who were on duty nearby, immediately responded to the emergency and shifted both the motorcyclists to PIMS. Ausburn produced his diplomatic card issued by the foreign office along with a valid driving licence to police. Subsequently, authorities shifted both the car and the diplomat to the Secretariat Police Station for legal formalities. SSP-Operations Najeebur Rehman Bugvi had said the diplomat would not be released until the Foreign Office verifies his diplomatic status and immunity. “Police have prepared an SOP to deal with such incidents, and as per the SOP diplomatic document would not be accepted by the police [for release] without its verification by the Foreign Office,” he said. In a similar incident involving another American diplomat, a motorcyclist in Islamabad was killed after being hit by a vehicle driven by a US military attaché earlier this month. Defence and air attaché at the US embassy Col Joseph Emanuel was driving a white SUV when he hit Ateeq and Raheel travelling on a motorbike. Resultantly, Ateeq died on the spot while Raheel suffered serious injuries and was hospitalised. In July 2010, a US embassy officer attached to the embassy’s Force Protection Department, had hit and killed a young man driving a motorcycle on the 7th Avenue. In February 2013, an administrative assistant at the US embassy hit two motorcyclists with his Land Cruiser near Kohsar Complex at Margalla Avenue. A man was killed and another was injured in the accident. In 2011, a Central Investigation Agency contractor Raymond Davis caused outrage throughout the country after he killed two Pakistani citizens when he hit a motorcycle in Lahore. The incident strained ties between Pakistan and US Davis was led out of the country after blood money was paid to the families of the victims. In November 2010, a member of the US Regional Affairs Office hit another embassy’s vehicle causing damage to both vehicles at Shahrah-e-Jamhuriat near Radio Pakistan.